Two of our ideas had kids documenting the world around them using mobile devices. Inspired by the experiments of Ben Stokes at USC and by the now-mothballed website “This is Broken,” we imagined youth armed with their camera phones taking pictures of things that respond to various prompts, e.g. “This is broken,” or “This could be better,” or “This is great!” The end result would be a civic map of a place from a youth perspective. The Prompted app would then ping anyone who walked by a location where a picture had been logged. It might prompt a question – “What would you do?” followed by a yes-or-no voting mechanism on possible actions, or a lightweight discussion. 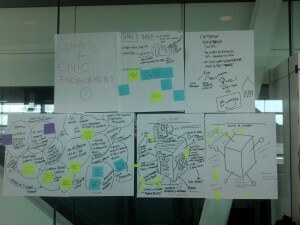 Another take on youth-created civic map was for participants to be able to look through photos taken by peers and begin to, in some fun or gamified way, tag and organize them. The focus would be on helping youth discover ideas or views they have in common as well as seeing other points of view. The third concept was a “Civic Mine” that operated more as a set of tools that might, in addition to the ideas already described, also include story builders. What particularly caught our group’s imagination from this concept was being able to “flash forward” into some possible future where a particular problem was solved, or “flash back” into history when a similar problem was previously addressed. The technology for developing a minimum viable product (MVP) for Prompted and especially Issue Sorter is already in the pockets of most kids today – mobile phones equipped with cameras, plus off-the-shelf systems like Flickr. In fact, an MVP has already been piloted and proven by Games for Change founder Ben Stokes during the course of his work at USC. Adding a geo-prompt or a sorting function would be a fairly simple task. Indeed, none of the technology presented here is all that challenging. The trick – as with most educational interventions – is to figure out how to get teachers in real schools to use it as part of an ordinary class experience. 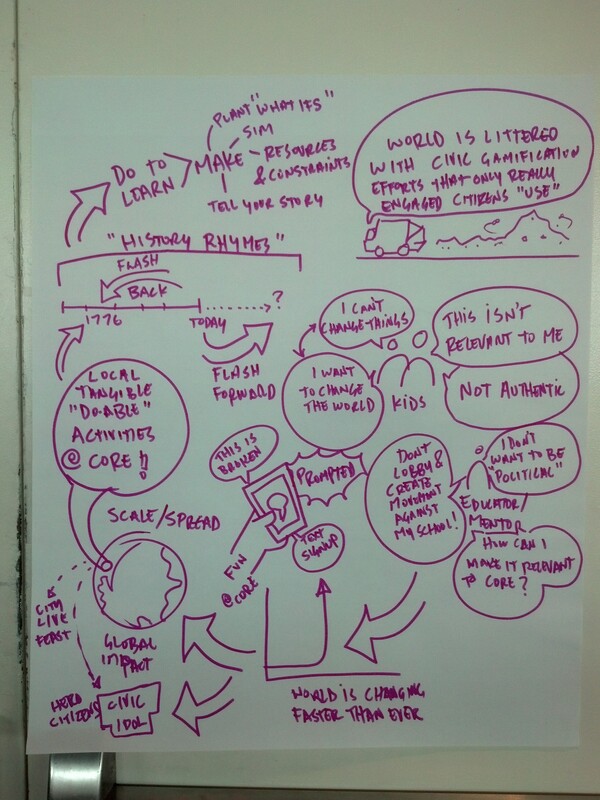 Graphic notes from our workshop session. 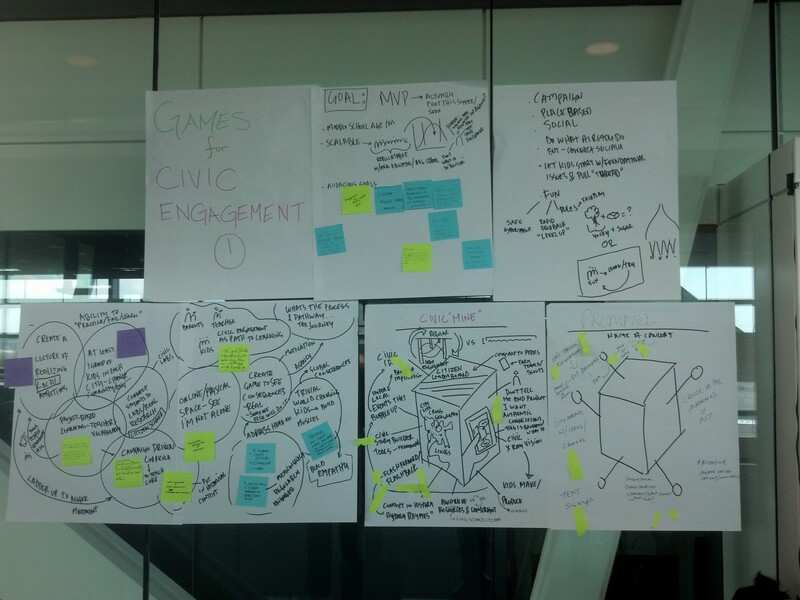 This entry was posted in Archival, Blog, Educational Games and tagged civic engagement, off-topic by Gene Koo. Bookmark the permalink. those with fair enough specifications, these can be with the lesser prices.